tubara cafe is owned and operated by veteran Wagashi (Traditional Japanese sweets) maker "Tsuruya Yoshinobu", which is located right next door. tubara cafe opened after the wife of Tsuruya Yoshinobu’s president thought, "I want more people to learn about and enjoy the true quality of simple Japanese Wagashi sweets." 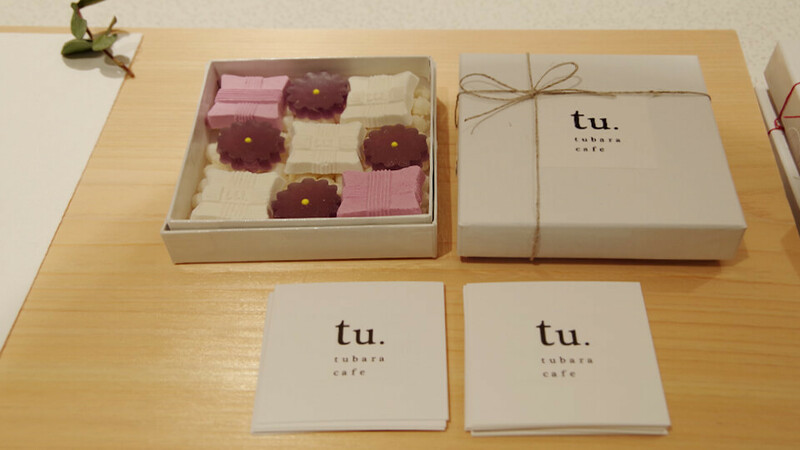 As a result, the sweets offered at tubara cafe were created with the intention of retaining the quality of long-cherished Japanese sweets, while also making them easy for modern audiences to enjoy. The cafe’s interior has elements of Japanese design — such as the large window that looks out onto the garden — while also incorporating an overall theme of white, to make for a calm and modern atmosphere. Although tubara cafe is in the city, they have created a peaceful space which helps you forget the flow of time. The name, "Tubara" apparently means "To keenly follow one's heart's desires." So why not enjoy some quiet alone time with some delicious sweets at tubara cafe? These two egg-shaped Manju (Sweet bean-paste buns) come to you in a little basket, just like a birds nests. The Manju are meant to symbolize the gentle scene of a crane — known in Japan as an omen of good fortune — lovingly caring for their chicks and protecting their eggs in a nest. These tubara cafe original Manju are simple, but it is precisely that simplicity that makes them the best for enjoying the modest flavors of traditional Japanese sweets. These "tubara tubara" sweets come in three flavors, Matcha, Yuzu and Rum and Raisin, and of them, you can choose two. tubara cafe's original tubara tubara have a cute "tu" branded into the top of them and are deliciously moist and chewy. Apparently, tubara café has them delivered directly from where they are made so they don’t lose any of their moistness. As mascarpone cheese is kneaded into the Anko (red bean paste) inside, the tubara tubara have a similar taste to western sweets, making them perfect for those who are not big fans of red bean paste. White bean paste made from white kidney beans and white azuki red beans are kneaded into the batter of this chiffon cake’s sponge. The distinctive quality of this chiffon cake has to be the all-around quality of its texture. Although normal chiffon cakes may be fluffier, because of the red bean paste incorporated into the batter, tubara cafe’s chiffon cake is moister and has a finer texture than other chiffon cakes. The chiffon cake is also served with a yuzu an (yuzu flavored red bean paste) cream. The refreshing citrus flavor of the yuzu goes exquisitely with the gentle sweetness of the cake. These chic cookies are cutely bundled together like a bunch of sticks. There are three flavors of cookie, ginger, Yukari (Shiso leaf sprinkles) and sesame miso, a unique line up that usually isn’t seen anywhere else. The saltiness of the sesame miso and Yukari go superbly with the balanced sweetness of the cookies and have a taste that lingers. Enjoy these cookies with a cute "tu" logo stamped Higashi (Dry Japanese candy). Item names are displayed also in English. Check the photos above for examples of tubara cafe’s sweets. 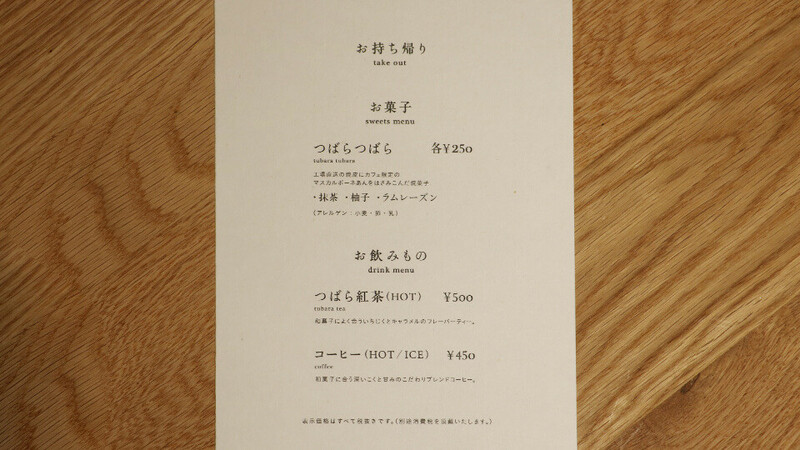 All drinks and sweets, including the above mentioned tubara tubara, can be ordered as takeout. The packaging of the Higashi (Dry Japanese candies) have a cute and modern design, so we definitely recommend them as gifts for friends or family. At tubara cafe you can enjoy traditional Japanese sweets in a relaxed atmosphere. Personally, I’m not a huge fan of the overly sweet traditional Japanese sweets and prefer ones that use mochi, but tubara cafe’s specialty tubara tubara are moist and chewy without being too sweet, making them absolutely perfect for me. I felt that this cafe was suited towards couples looking to spend some quiet time together over some lovely sweets, more than it was to families. Next time, I would like to bring my wife here, just the two of us. In a good way, this cafe breaks the mold of "Traditional Japanese sweets." I feel like even those who usually aren't too familiar with Japanese sweets can rediscover the charm of Japanese sweets at tubara cafe, thinking "Were Japanese sweets always this elegant, taste this good and look this cute! ?” What I personally really enjoyed was how well the sweets and drinks went together. Until now, I always thought of “green tea” going with Japanese sweets, but tubara cafe made me realize how great they go with coffee and black tea as well! From now on I might try having them with either coffee or black tea. With the headquarters of the over 200-year-old Japanese sweets maker, Tsuruya Yoshinobu, right next door, tubara cafe is a modern spin on a Japanese classic. Their cute original sweets “tubara tubara” live up to their Instagram hype. The filling, with just the right level of sweetness, give you the feeling of a traditional Japanese dessert, while the pancake-like outside is chewy and much more like a western style pancake than say that of a Japanese Dorayaki. However, for me personally, the coffee left something to be desired. If you're someone like me who enjoys a barista made latte, then you might want to go for their special tubara tea, a black tea that goes perfectly with their sweets. 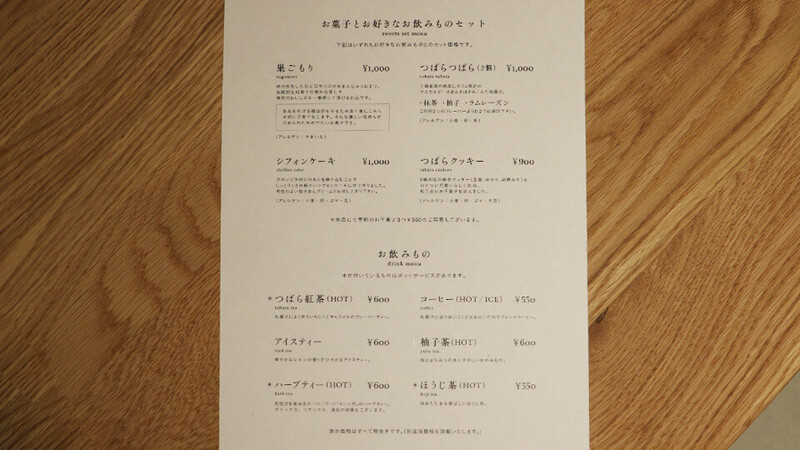 Although there are no menu descriptions in English, they know basic English and will serve you kindly.